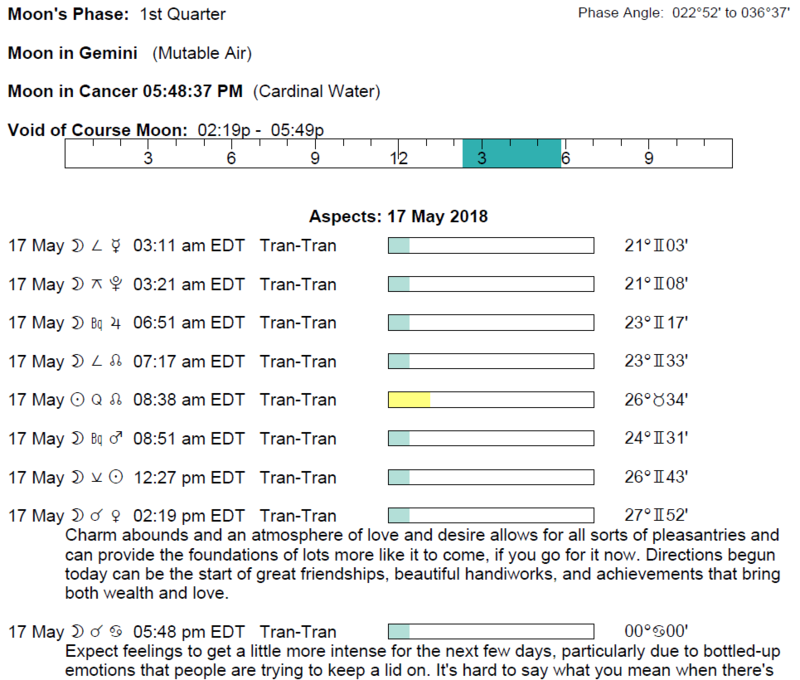 The Moon is in Gemini until 5:47 PM, after which the Moon is in Cancer. 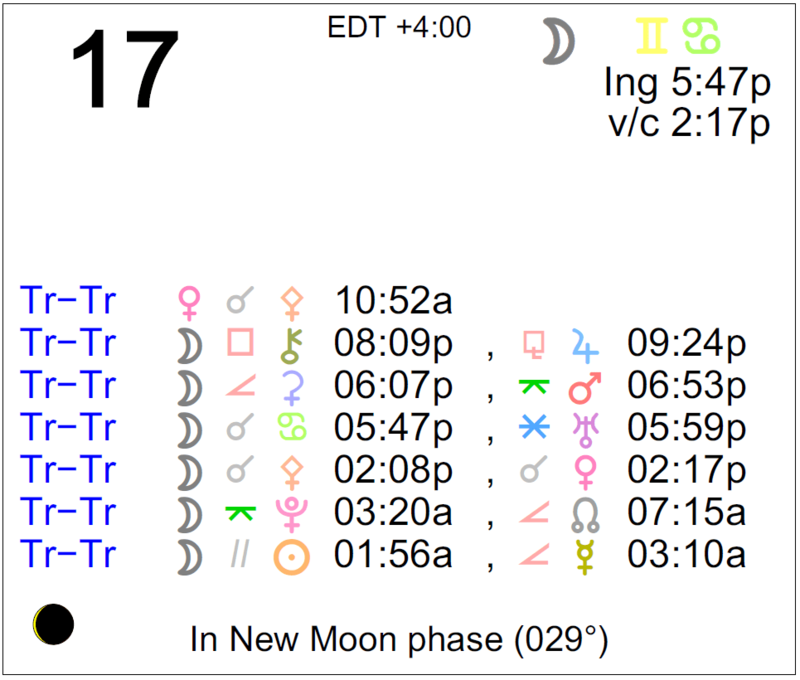 The New Moon occurred on the 15th in the sign of Taurus, and the First Quarter Moon will occur on the 21st. Mars is in its pre-retrograde shadow (Mars will retrograde from June 26th to August 27th). Mars spends its first full day in Aquarius (Mars transits Aquarius from May 16-August 12 and then September 10-November 15). 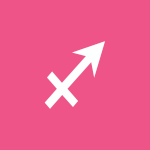 Uranus is transitioning out of your sign this year and the next, dear Aries, taking the pressure off you to assert your independence. With its new transit of your resources sector, there can be excitement revolving around finances and possessions now and in the coming years. There might be a sudden change in financial position, even a windfall or significant gift, a sudden urge to spend or invest money, a new money-making idea or project that seems to come out of the blue, or new insights into money, earning power, or self-worth. You are challenged to think outside of the box for devising viable plans to improve your finances, or you may be seeking alternative sources of income. Today, you’re in good shape for smoothing over differences with others, for coming to agreements with others, and for expressing yourself more eloquently in your communications. You’re in a good position for organizing your daily affairs, projects, or studies, and with this improved design, you feel more inspired to learn, connect, write, and share your ideas. People appreciate your viewpoint, intelligence, and insight, as well as your sense of fairness and impartiality. 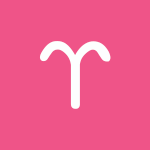 Sound energy is with you for problem-solving with business, financial, and practical affairs, dear Taurus, and arriving at pragmatic solutions. You’re also in a strong position for sorting out money or ownership dilemmas and problems. There is a better chance that people cooperate and come to fair agreements today than usual. Uranus is now in your sign and will transit Taurus for the better part of the next eight years. During this cycle, you’ll be making significant changes regarding the way you express yourself. Changes are also highly likely in your home, career, and partnerships, as well. Inner changes are now translated to the outside world, and you’ll be seeking entirely new experiences during this long-term cycle. It’s a time of a personal revolution in your life, and you may surprise a few people now! Your ideas are particularly well-received today, dear Gemini, and others seem to want to be around you. Contacts made now can be quite fruitful and may expand your perspective on a matter delightfully. There can be creative inspiration and good feedback on your projects. Venus and Pallas come together in your sign today and you might come to an agreement, or you might resolve a problem now that allows you to move forward. Your creative ideas and unique insight are appreciated, noticed, and perhaps even applauded by others now. Your intelligence is playing a significant role in your considerable attractiveness at the moment. With Uranus now transiting your privacy and soul sector for most of the coming eight years, you’re going through a process of detaching yourself from elements of the past that have been interfering with your self-expression. In the coming years, some skeletons in your closet will be revealed and dealt with so that you can move forward, grow, improve, and explore. 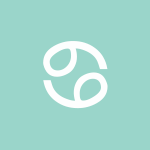 Uranus is now transiting your friendship sector, dear Cancer, where it will transit for many years to come. During this cycle, your relationships with friends and groups will receive a bit of a shake-up, and you’re likely to be meeting new and unusual people who introduce you to exciting ideas and ways of life. As you seek more authenticity in your friendships, you may go through some social ups and downs. Today, you’re likely to find people to be particularly reasonable and ready to talk through problems. The day can be constructive for finding the right resources to resolve a conflict or a personal challenge. Attention to the mental or emotional side of health is essential today and can lead you to important discoveries. 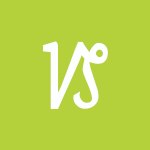 Venus and Pallas come together in your privacy sector, and you can find exactly the right resources to resolve a conflict. Your private life or time with yourself is particularly rewarding and confidence-boosting now. 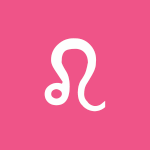 Uranus is now transiting your career and reputation sector, dear Leo, where it will transit for the most of the coming eight years. During this cycle, you will be learning to express yourself more uniquely and authentically in your professional and public life. Changes in your relationships with authority figures or the public, and in your work itself are likely. You’ll be wanting more independence and freedom professionally speaking and perhaps even discovering a true calling. Today, good energy is with you for mapping out plans, making fruitful connections, and coming to agreements. You might meet particularly unique and interesting people now, or a new friend who introduces you to fascinating ideas or groups. You can feel quite a bit of excitement about plans for the future. Uranus is now transiting your adventure sector, dear Virgo, where this slow-moving planet will stay for the most of the coming eight years. During this long-term cycle, you’ll be more open to new belief systems, traveling, and other adventure-seeking activities. You might become restless with certain routines, particularly related to learning and communications. You’ll be expressing yourself with more spontaneity and embracing your own more unique qualities. The desire to take a new course or to travel can come up suddenly as you hunger for new experiences. Today is an excellent time for formulating goals, connecting with people who can advance your goals, and good relations on the job or with people in high positions. 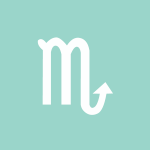 Uranus has just left your partnership sector where it has transited since 2010-2011, dear Libra. During this period, changes in your one-to-one relationships were par for the course. Now that Uranus has moved on (not consistently, but almost! ), your relationships are likely to settle down a little. However, with Uranus now moving through your intimacy sector, the ways that you share yourself and your money are set to change and evolve over the coming years. Sudden developments in the financial or emotional support you receive are possible. This can also be a highly creative time for handling money, talents, and relationships. The important thing with this transit is to open up to alternative, new, progressive, or non-traditional ways of doing things without throwing practical considerations out in the process. Today, you might enjoy making long-term plans related to travel, writing, and studies. Sharing your ideas, viewpoints, and beliefs and listening to others’ experiences can be particularly inspiring and pleasant right now. You’re willing to take a fresh approach to teaching, guiding, learning, and communicating today. 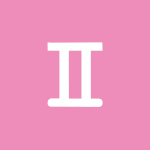 Uranus has just left your work and health sector, dear Scorpio, and has set up camp in your partnership sector where it will stay for most of the coming 7-8 years. This is a long-term influence that will take some time to evolve and unfold. Your daily routines are apt to stabilize or level out while there can be some destabilizing influences on your close relationships with others. It’s time to alter the ways you relate and connect. Attempts to enforce convention or tradition on partnerships will be a lesson in frustration during this period! Today, there is good energy with you for resolving conflicts or coming to agreements with others that honestly work as people are particularly fair and open-minded. 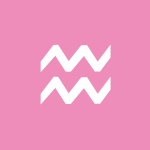 Uranus has just recently left your romance and creativity sector, dear Sagittarius, and has now set up camp in your work and health sector where it will spend most of the next 7-8 years. This is a long-term influence that will take some time to evolve and unfold. Your romantic life is likely to level out although there can be some destabilizing influences on your working life and daily routines. It’s a time when sticking to your usual habits or methods fails to satisfy, and thus can be challenging. Rest assured that new, more authentic, ways of expressing yourself through your work will be discovered. Today, you’re dealing with reasonable, fair, and balanced people, or your unique approach to others brings out their sense of fairness. Debates, counseling sessions, consultations, brainstorming, and any other interpersonal problem-solving and decision-making can be wonderfully successful now. Personal and social needs blend well today. 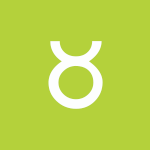 Uranus has just recently begun its long-term transit of your solar fifth house, dear Capricorn. Sign changes occur approximately every 7-8 years, making this a highly significant move! Except for November to March, this transit will stick around until 2025-2026. During this cycle, you may be attracting more unconventional people and unusual set-ups on a romantic level into your life. You’re also likely to expand your interests and discover untapped creative talents. Unique opportunities to meet people pop up or unconventional love affairs can be a new thing for you. All in all, it’s a good time for expressing yourself more freely. You may be very eager to march to the beat of your own drum. Taking creative or romantic chances is possible now. Today, you are in an excellent position for organizing, planning, and sorting, and thoroughly enjoying yourself as you do! There can be a pleasant blend of social and work elements now. Helping others solve a problem can be in focus, and for some of you, your services are recommended or otherwise appreciated. Uranus, your ruler, has just changed signs, dear Aquarius, and is now transiting the home and family sector of your solar chart. While Uranus will return to your communications sector for four months starting in November, it will spend the better part of the next eight years in your home sector! During this cycle, your attitude towards home and family is likely to change, and there can be unconventional or erratic energy surrounding domestic matters. Some of you will decide that it’s time to move or to dramatically change current living conditions. Today, love relationships benefit from a feeling of balance and mutual understanding. Creative design comes more easily now as you envision what you want to accomplish more readily than usual. Making long-term plans or mapping out a project may figure strongly. Others are attracted to your vision or your unique ideas. 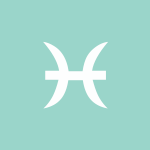 Uranus has just begun its long-term transit of your communications sector, dear Pisces, and because sign changes occur only about every seven years or so for this planet, it’s an especially significant change. 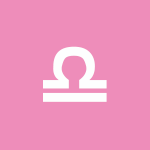 Uranus here can introduce you to a broader and perhaps eclectic array of mental interests. This cycle revolutionizes the ways you communicate and connect with the world around you. You’ll be opening up and expressing your more unique ideas more often. As you think differently, you communicate differently. Today, you see real value in making peace with people and bringing more harmony to your environment. You have a strong sense of design and feel for patterns and color, and this can also work in your favor on an emotional level as you can see past patterns of relating more clearly which, in turn, helps you make better choices in the present. Above are astrological event highlights for the day. Full Horoscopes are at Cafe Astrology. 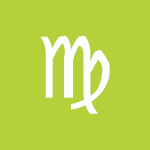 If Your Birthday is May 17th, If Today is Your Birthday full horoscope here. This is a time of imagination and intuition, when we can draw upon our internal wisdom. There is a good ability to successfully combine logic and intuition, and to understand problems taking into account the human element. There is sensitivity to people’s issues now. Cooperation. Effective, sensitive decision making. We are especially concerned with being fair to one another. We seek out balance and peace in our relationships. The platonic elements of a relationship may be emphasized now. This can also be a very creative, artistic time. Air signs are Gemini, Libra, and Aquarius. We tend to favor rational, objective thought over emotions, impulses, and feelings at this time. We are more intellectual, fair-minded, and logical in our approach, Ideas flow easily and quickly, we are more communicative and guided by principles, and also somewhat dispassionate or impersonal. Sabian Symbol: A young gypsy emerging from the woods gazes at far cities. We are less inhibited and more willing to indulge ourselves. Decorating, beauty treatments, the arts, creative pursuits, parties, dates, and recreation are generally favored now. There is increased sensitivity, affection, and warmth. We are cautious, careful, tuned in to details, and rely on common sense at this time. We enjoy connecting and communicating, exchanging ideas. We seek out variety in our entertainment and with people. We can have many different ideas for enjoying ourselves or making money and we’re not bound to any one particular idea. Sabian Symbol: Bankruptcy granted to him, a man leaves the court. You like relationships which offer you the opportunity to express your individuality. Sabian Symbol: An angel carrying a harp. You need freedom within your relationships and may become impatient if this is denied. If you do not express your own need for independence you may attract a dominant partner. Cnj 26°Ta24 ALGOL— Female passion and intensity. Sun 02° Taurus 53' 08"
Moon 22° Sagittarius 03' 17"
Mercury 08° Aries 02' 55"